Wa-Bocho, or Japanese-style knives, trace their origin to the days of the samurai warriors. In fact, the same hand-forging methods used to produce samurai swords are still used today to create these classic kitchen blades, which are among the finest cutlery available in the culinary world. In traditional Japanese cuisine, special iphasis is placed on highlighting a chef's skill through intricate knife work. To achieve this mastery, Japanese chefs rely on a variety of specialized Wa-Bocho to prepare vegetables, fish, and meat. The key to these traditional knives is the kataba. The Wa-Bocho has one distinct feature different from Western knives: The kataba, or beveled blade. What this means is that the outer side of the blade is sharpened with a beveled edge, while the inner side riains flat. 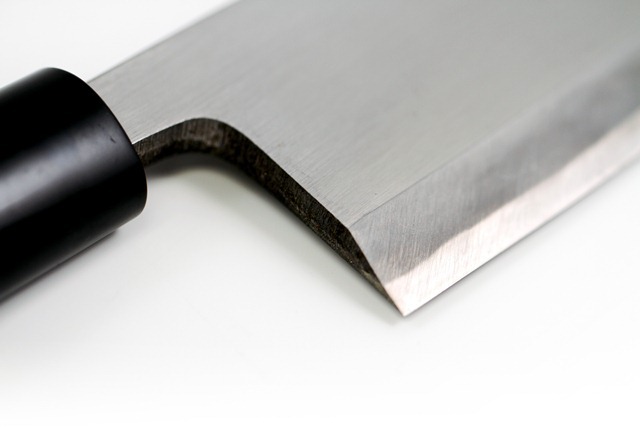 While the blade is flat on the inner side, the surface is actually slightly concave (urasuki), giving it the same effect as perforated knives or knives with hollowed edges. Japanese professional chefs prefer these beveled knives, which facilitate extriely precise cutting and clean food separation from the blade. In Japanese cuisine, many ingredients such as fish and vegetables are served raw, and the aesthetics of these foods has always been a vital factor. The use of Wa-bocho reflects this culinary tradition. 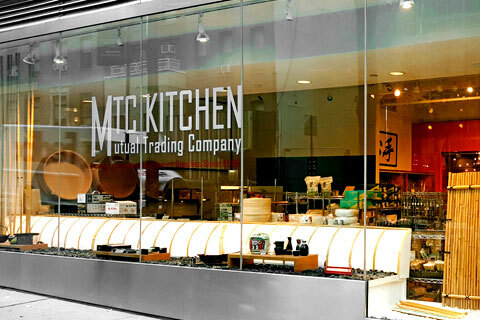 A well-maintained, single bevel Japanese-style knife allows chefs to cut delicate ingredients with speed, control and precision. With sashimi, for example, the use of a Wa-bocho produces perfectly smooth, glossy slices of fish, without bruised or rough surfaces. Western knives, which are beveled on both sides of the blade, are more practical on tougher foods such as meat. The Honyaki begins as a solid piece of steel with a high carbon content. After being heated treated, the steel is hammered repeatedly to form the shape of a blade and evenly distribute the carbon and chromium molecules. This forging process, called Hizukuri, eliminates impurities from the metal to create pure steel. 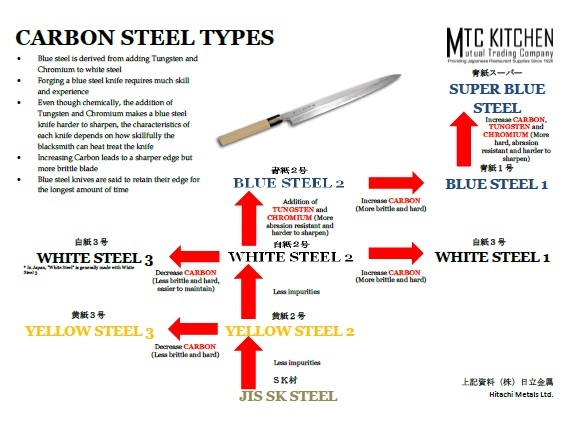 The metal is tipered using either water for the Mizu-Honyaki process, or oil for Abura-Yaki, a process which tipers the brittle steel to produce a durable and sturdy piece. Forging a Honyaki blade is a long and arduous task that can only be carried out by highly skilled blacksmiths. Due to its extriely hard edge, the blade retains its sharpness for longer compared to other Japanese knives, but these knives also take more time to sharpen, and in general, are more difficult to maintain because they are more brittle. But the Honyaki is highly prized and considered the top grade knife in Japan. It is the blade preferred by the most skilled professional chefs who have a deep understanding of knives and knife maintenance. The blade on a Kasumi consists of two layers of metal forged together. The actual cutting edge and backside of the blade is carbon steel, while the supporting spine and rest of the blade is iron, which makes the sharpening process easier. 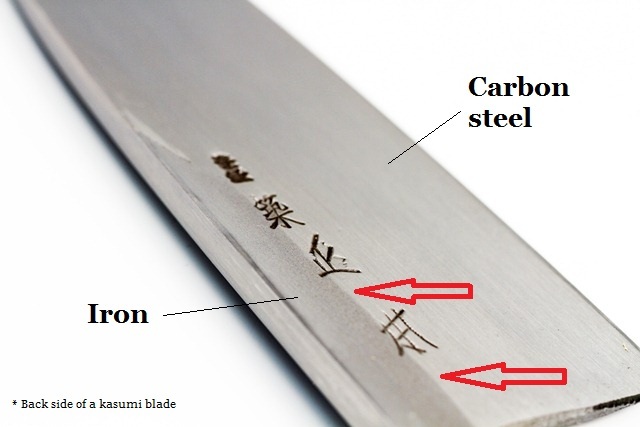 If you look at the backside of a kasumi knife, you can actually see that the knife is composed of two different metals.